Oh, my! Determined to present something "classy" for a change, Archibald Asparagus has taken over VeggieTales! Assisted by those rascally French Peas, Archibald aims for new heights in veggie programming by attempting to produce "the world's first all-vegetable staging of Shakespeare's Hamlet," the first-ever "Classy Songs with Larry," and for the grand finale, the world premiere of what he believes to be Gilbert and Sullivan's lost musical: Lyle the Kindly Viking! Of course, working with the French Peas as assistants is a recipe for disaster and in the chaos --and hilarity -- that ensues, Bob, Larry, and Junior all learn a great lesson about sharing. Archibald, on the other hand, mostly just learns to never again work with the French Peas. 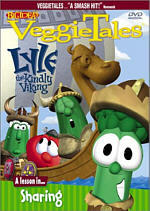 Don't miss Junior Asparagus as "Lyle the Kindly Viking" in this hilarious VeggieTales musical adventure! Your whole family will sing -- and laugh -- along as they learn that "sharing gets us more of what we really want -- friends!" DVD: Fullscreen 1.33:1; audio English Dolby Digital 5.1 & Dolby Surround; subtitles none; not closed-captioned; single sided - single layered; 12 chapters; Not rated; 37 min. ; $14.98; 3/24/01. Supplements: “Interviews With Phil and Tim”; Widescreen Silly Song; Story Reel; Jonah Trailer. If I’ve said it once, I’ve said it a thousand times: when is someone going to create a kids’ show that features computer-animated vegetables that deliver Christian-themed messages? Now, apparently, since VeggieTales fills the void that has long plagued mankind. Okay, I’ll deactivate my sarcasm mode, but you have to admit: VeggieTales works from an awfully odd concept. Apparently the series of videos started in the mid-Nineties, but I never heard of the show until the DVD arrived in my mailbox. Actually, that isn’t totally true. I recall that my friend Kevin once mentioned that his mother tried to shove the series on him during one of his occasional visits to their palatial Texas homestead. It seems odd that she’s attempt to get a thirty-something man to check out this kids’ program, but Marg (Kevin’s mom) always was a little different. However, I can’t quibble too much with her efforts now that I’ve actually seen some one of the shows. While the programs have long been out on VHS, their first incursion into the wild world of DVD occurs with Lyle the Kindly Viking. Subtitled “A Lesson In… Sharing”, that theme would run throughout the program, as the piece gently reminds kids that they need to remember to be generous. The entire enterprise was a little disconcerting for someone totally new to the series, but it wasn’t too tough to pick up on things. From what I understand, Bob the Tomato and Larry the Cucumber host all VeggieTales programs. However, in the spirit of sharing, they hand over the reins of this episode to cultural czar Archibald Asparagus. Apparently Archie always wants to make things a little more high brow, so here he gets his chance. However, the other Veggies tend to accidentally subvert his efforts in cute ways. As such, the desired production of Hamlet becomes Omelet, while a lost operetta by Gilbert and Sullivan - the titular “Lyle” piece - turns out to be a case of mistaken identity. Essentially Lyle consists of a few musical vignettes that humorously illustrate the “sharing” theme. “Omelet” launches the show, and then we find one of what seems to be a running bit, “Larry’s Silly Songs”. However, in the spirit of Archibald’s remake, this becomes “Classy Songs with Larry” as he does an operatic ditty called “Larry’s High Silk Hat”. “Lyle” dominates the show as we see the adventures of a nice little Viking who prefers to give rather than plunder. As a whole, the show keeps the tone light and fun, and it rarely becomes preachy. Yes, some of the mentions of God felt a little forced. Every once in a while the “sharing” theme would be pointedly reinforced by a mention of God’s desires. It’s fine to go for that angle, but I thought those moments weren’t terribly well-integrated. The sharing moments flowed fairly effortlessly, but the specific mentions of God seemed to be a bit tacked on and superfluous. Still, Lyle keeps these to a minimum as it makes its points through other methods. The computer animation is pretty simplistic, but the cartoon characters are attractive and bouncy, and they seem acceptably vivid and animated. The voices fit them well and add nice dimensionality to the antics. As a whole, the program isn’t something that I’d ever care to watch on my own, but if I had kids, it would be a fairly enjoyable show to share with them. Hey look - I learned something from VeggieTales! Actually, since I don’t have children, I can’t directly speak to the state of kiddie fare, but I get the distinct impression that most of it is fairly abysmal. There don’t seem to be many programs that will entertain kids in a gentle and light-hearted manner and also be fairly entertaining for adults at the same time, but based on Lyle the Kindly Viking, VeggieTales appears to fit the bill. Lyle the Kindly Viking appears in an aspect ratio of 1.33:1 on this single-sided, single-layered DVD; due to those dimensions, the image has not been enhanced for 16X9 televisions. All told, this was a very nice transfer with very few concerns to mar the presentation. Sharpness seemed to be consistently positive. The picture looked crisp and detailed at all times, as I witnessed no signs of softness or fuzziness. However, some jagged edges appeared, and a few examples of moiré effects occurred as well; these were minor but occasionally noticeable. Unintentional print flaws seemed to be totally absent. I needed to use that qualifier because some grit and vertical lines popped up during “Larry’s Classy Songs”, but it appeared obvious that the show’s producers created these to give the number an artificially worn and old look. Otherwise, the program completely lacked any form of defects. Apparently the world of VeggieTales offers a very bright and varied palette, and Lyle followed with a strong batch of colors. The tones remained appropriately cartoonish and bold, and they were displayed in a very solid manner. At no time did any of the colors show signs of bleeding, noise or other concerns, as they always looked tight and distinct. Black levels were also nicely deep and rich, and though shadow detail was only a minor consideration, all of those sorts of shots came across as appropriately clean and visible. Ultimately, Lyle provided a very satisfying visual experience. Also fairly strong was the Dolby Digital 5.1 soundtrack of Lyle the Kindly Viking. For the most part, this soundfield stayed with an emphasis on the forward spectrum, where it offered nicely broad and engaging audio at times. Effects tended to appear “speaker specific” and they didn’t blend together exceptionally well, however. Vegetables would walk - or hop, actually - from side to side, but oddly, their voices almost always remained centered. The only exceptions occurred when a character spoke totally from off-screen; on those occasions, the speech came from hard left or right. However, I never heard dialogue pan along with the bouncing sounds. Music seemed to be nicely delineated, however, as the show provided positive stereo separation. The rear speakers backed up the music well, and some decent effects usage also occurred. In general, the surrounds remained minor partners, but they became more active at times. For example, the thunderstorm toward the end of the show offered a rather forceful and involving piece of work. As a whole, Lyle showed fairly useful usage of all five speakers, though it wasn’t a tremendously powerful piece. Audio quality seemed to be fine across the board. Dialogue was consistently warm and natural, and it showed no signs of edginess or problems related to intelligibility. Effects sounded clean and accurate, and when appropriate - such as during the aforementioned storm sequence - they came to life quite vividly. For the most part, bass response was a bit tepid, and the subwoofer received little work, but some rich low-end did crop up at times. Music demonstrated fairly positive dimensionality. Again, the bass could have sounded richer and deeper, but I thought the range of the tunes remained quite acceptable throughout the show. In the end, Lyle didn’t give us a stellar auditory experience, but I thought the mix worked quite well as a whole. Lyle also includes a very minor smattering of extras. We get a trailer for the 2002 theatrical release of Jonah, the first VeggieTales movie. Annoyingly, this clip falls into the “forced trailer” category to a degree; when you start Lyle, the ad pops up without any choice. It also appears on the extra menu. You can easily skip the trailer when you begin the program, but I still don’t care for its appearance nonetheless. Interviews With Phil and Tim includes some comments from Big Idea founder and “Top Tomato” Phil Vischer - who also provides the voice of Bob the Tomato - and director Tim Hodge. Both were filmed separately for this five minute and 55 second piece, during which they discuss some specifics behind the making of Lyle. They give us a few interesting details, and we even see a storyreel for an unused sequence, but this remains a very superficial little program. Speaking of storyreels, we get one for a short song snippet from Lyle. The 45-second piece shows the original storyreel - a filmed set of storyboards accompanied by audio - on the left of the screen while the final product runs on the right. It’s moderately interesting but not terribly useful, mainly due to its brevity. Lastly, we find a widescreen version of the Silly Song, “Larry’s High Silk Hat”. This three minute and 55 second clip was the same program shown in the final product except the letterboxed transfer exposed some material on the sides of the frame. Nothing valuable appeared there, as we just saw more space on the edges. However, this snippet confused me. From what I understand, 1.33:1 is the original - and appropriate - aspect ratio for the VeggieTales. So why do we have an approximately 1.85:1 version? Perhaps the computer material is also composed for that ratio so it can be shown in those dimensions in foreign markets. Nothing in the fullscreen image seemed to be cramped or cropped, so it simply looked as though the widescreen picture offered more - but superfluous - information. Nonetheless, I found this aspect of the DVD to provoke more questions than it answered. Normally I’d run screaming from a Christian-themed kids’ show about sharing, but I must admit that VeggieTales’ Lyle the Kindly Viking provided a moderately entertaining and winning experience. The program maintained a consistently light and fun attitude that didn’t take itself too seriously, but it also gently conveyed a positive message for the youngsters. The DVD offered a terrific picture along with very good sound, though it skimped on extras. With a list price of $14.98, Lyle certainly won’t break any banks, but it’s hard to judge the value of the program since it runs for only 37 minutes. However, if you have kids who would enjoy VeggieTales, I’d say it merits the cost. After all, that’s still pretty cheap, and little ones tend to play the same program over and over anyway, so a fun and compelling show like this will likely be worth the minor expense. However, if the folks from Big Idea - the parent company behind VeggieTales - are out there, they should consider a slightly higher list price with two episodes per DVD; that’d make the packages a better bargain.